In case anyone has been wondering where I have been, this was my apartment last Wednesday night when I got home. Yes, that's water. Yes that's Kitty looking at the water, utterly confused. Anywho, in the meantime while we're waiting for new carpet, we're staying with Idiotboy! Recently, the amazing creative power-house Miss Violet came up with an idea - and here it is. Here is my introduction of myself to the Plurkette Hencircle. My name is Jadie (aka Jessi). I first learned to knit when I was quite young, my mom taught me. I remember trying to work in some cat hair with a horrid coral acrylic for a scarf - but I don't think I ever finished it. I got back into knitting just a few years ago as my marriage was nearing its end. I had gotten a knifty knitter and was making scarves. Then I discovered that there were knitting podcasts! I found Lime and Violet, Stash and Burn, and eventually quite a few more - and then through those podcasts I joined Ravelry, where I became even more involved in the knitting internet community. From there I've moved onto hats, felted mice, and socks! Lewis encouraged me to join a few "microblogging" sites like Twitter, Pownce, and most recently Plurk. Plurk has quickly become quite an obsession, as litterally hundreds of knitters have invaded en masse. Before podcasts, Ravelry (and all the groups I've found) I always thought I was sort of odd, for being a relatively young knitter, who likes metal music, Video Games, and has tattoos etc. But I'm not! While I am a unique snowflake, there's thousands of knitters of all shapes/sizes/walks of life, and I'm thrilled to have found so many who I have at least a few things in common with. They're the most warm, generous, encouraging group ever and I love you all! I'm a bit domestically challened. I don't like to cook, I have a pretty high tolerance for mess vs cleaning, and I kill any plant I touch. I've already gotten re-energized in writing and knitting through some other side projects, and I hope that being part of the henhouse will encourage me to try some cooking, and maybe even a plant or two. Some of my fondest memories are of walking in our garden and eating raw lima beans, and enjoying Mom's zucchini bread all summer. I'd like to think one day I might be able to grow and make my own. So that's it.... Hopefully we'll be back home by this weekend so we can enjoy the 3 days off. Great! You've inspired me! Now I will go off to write MY hencircle intro! I'm BRKDana in Plurk and the friend that pulled me into it is Sallee (aka Knitnana). I've been on Plurk for all of five minutes and am still learning the ropes, but I'll look for you. 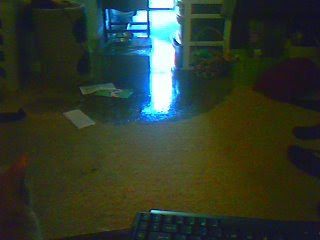 So sorry to read about your apartment flooding - - that is awful - - and I hope you get to move back in very soon. Not a good "return from vacation" story at all. Hope you have a good 4th too! I was sorry to hear about your apartment flooding. :-( As for killing plants. I have that problem as well but much to my surprise I bought a small christmas type tree at Christmas and it's STILL alive! HOORAY! I am so shocked!